Invisibility serves the abuse of power only too well in the continued struggle of ordinary Colombians. Thus, understanding the context of recent astounding events in this nation, post peace-accords, is essential, because it is illustrative of the difficult path to be traversed towards real peace and democracy. Let us be clear. What Colombians now have is not just a “right-wing” government. It is a government infused with callousness, incompetence and deceit, where that minority who bleed the country dry, (and often literally to death – at least 533 human rights defenders have been killed since 2016 ), continue to implement a moribund and savage version of neo-liberalism. That is the creed: an inhumane project elaborated via a dual minority elite business/latifundial alliance working hand-in-hand with military/narco-paramilitary support, financed by billions of war-dollars from abroad – ostensibly, to sequentially, and unsuccessfully, “fight communism”, “eradicate the drug-trade” and “get rid of terrorism”. In truth, the billions of military funds invested have actually gone into cementing a ruthless state and its repressive apparatus, in favour of its cronies, thriving in a country where the “oldest democracy on the continent” paradoxically exists alongside extreme inequality and injustice. And, even though most conflict with the largest guerrilla organization, Fuerzas Armadas Revolucionarias de Colombia (FARC) has now stopped, there are now persistent attempts at watering down the Peace Agreements and negotiations with the other major guerrilla combatants, the Ejercito de Liberacion Nacional (ELN), has ground to a halt. So it is that, this August 2018, under far-right ex-president Alvaro Uribe’s tutelage, Ivan Duque, ex-technocrat for the Interamerican Bank for International development (IBID) and, despite disproven Harvard qualifications, took the presidency. In these last brief 100 days, whilst the country convulses from crisis to crisis, Duque appears to perform with pre-programmed ideological vacuousness. In these last brief 100 days, whilst the country convulses from crisis to crisis, Duque appears to perform with pre-programmed ideological vacuousness. Now and again, he makes an appearance to threaten on-going national protests called by beleaguered social movements and trade-unions. This he does with the help of his new defence minister, Guillermo Botero - an industrialist and firm believer in the glyphosphate fumigation of coca plantations and the curbing of peaceful protest, via the ESMAD riot squads, if necessary. Duque, via Finance Minister, Alberto Carrasquilla, has gone back on pre-election promises to avoid over-taxing the poor and to properly invest in education and health, to name a few. Support for anti-corruption initiatives is tepid and the urgency of climate change has also by-passed this administration. The national plan is to carry on with fossil fuel exporting, including fracking  . The omens for the next four years have not been good. His approval rating is now at 22% . But Duque is not recognizably the string-puller, but part of the grand plan. This is now even more evident, especially after the sudden deaths of Aval Group auditor, Jorge Enrique Pizano, on 8 November 2018, and the cyanide poisoning of his son, three days later, both key witnesses in the Odebrecht scandal in Colombia. As is well known, Brazilian infrastructure giant Odebrecht has been implicated in huge bribery scandals all over Latin America . In most countries judicial prosecutions are in progress. In Colombia, however, bringing those guilty to justice has been slow and often obstructed. But, in foreboding of his death or disappearance, Pizano left his investigative evidence with a number of reliable journalists and parliamentarians – including Senator Gustavo Petro of the Colombia Humana / Decentes movement. 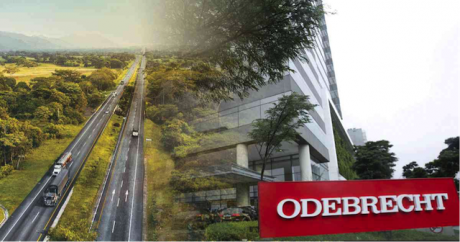 The video, recordings and documents referred to the suspected corruption he found in his auditing of the accounts of some of Odebrecht’s key business partners. In particular, the Corficolombiana bank, part of the Aval group, both owned by Colombia’s richest man, the banker Luis Carlos Sarmiento . Pizano also refers in the documents and recordings to inexplicable lack of cooperation by Sarmiento’s then lawyer, Nestor Humberto Martinez (NHM). The paradox is that the latter is now in post, as Colombia’s Chief Prosecutor - in charge of investigating Odebrecht corruption. And further, he denies prior knowledge of Pizano’s accusations – despite audio recordings by Pizano, which disprove that. Last week therefore, on Tuesday 27th November 2018, a historical emergency debate on Odebrecht corruption was scheduled by senators of the opposition. 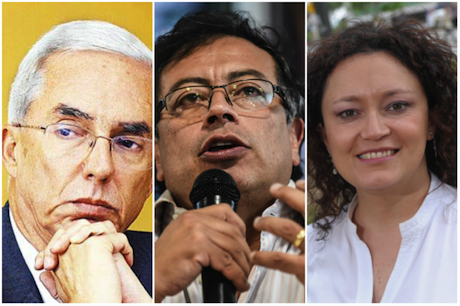 The 8-hour long session was led by opposition Senators, Gustavo Petro, Jorge Enrique Robledo (Polo Democrático), and Angelica Lozano (Green Party). It was one of those earth-shattering moments when business-as-usual came to a shuddering halt, and the veil hiding the causes of oppression, was suddenly ripped. The raison d’etre, for extreme violence and rampant corruption in Colombia, was openly hung-out for all to see and judge. And it was not a pretty sight. Last week debate was one of those earth-shattering moments when business-as-usual came to a shuddering halt, and the veil hiding the causes of oppression, was suddenly ripped. The debate amply illustrated the unbelievable spider’s web of relationships between Odebrecht bribes, private enterprise and the Colombian state. 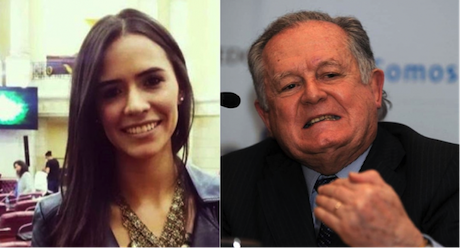 Both Uribe and Santo’s presidential campaigns appear to have been funded by Odebrecht money. And even Duque has been identified as having been present at a meeting in Brazil with Odebrecht functionaries, when he was Senator, in 2014. (In clarification, he did state that he had left the room to go to the toilet, during bribery discussions ). Obviously, what Odebrecht has been interested in are the lucrative infrastructure contracts it could obtain through the allocation of strategic bribes to politicians and ministries. Some of the largest infrastructure projects in Colombia were handed over to Odebrecht and its collaborating companies in Colombia , through complex financial arrangements, and third parties, which render opaque the system of bribery, through fictitious firms and through overpricing, which has resulted. The disaster for Colombians is that, with all too frequent regularity, infrastructure projects have either been badly executed (at times causing loss of life ) and/or exponentially expensive, causing great strains on public funds. According to the evidence presented at the Senate debate , Odebrecht’s declaration to the US Department of Justice, recently, seems to have under-played both the number of fictitious construction contracts and amounts of money laundered as bribes, in Colombia . Only about a 1/3 of transactions seem to be accounted for, and in further the Colombian State Prosecutors Office has been slow to investigate. Most worryingly, the Senators’ debate indicated how NHM with his prior myriad posts as lawyer for several of the involved companies and subsequent work as public functionary, seems to have acted as both architect and legislator for many of these questionable deals. During the debate, opposition senators strongly called for NHM to immediately resign as Chief Prosecutor, due to undeclared conflicts of interest. This he roundly refuses to do, and his politicized personal defence at the Senate debate, was delivered with threats to both debating Senators and members of the press, who had published the details of this unsavoury and questionable labyrinth of business dealings. This includes nationally and internationally reputable journalists such as Daniel Coronell and Maria Jimena Duzan. The latter, and others, have now been forced to appeal to the UN Human Rights Commission in Colombia, to protect their freedom of expression. But the powerful corrupt undercurrents in Colombia cannot forgive the Senators, most especially, Gustavo Petro. Senator Petro has been a thorn in their side since his key debates back in 2007 revealed the links between politicians, corrupt business and the human rights abuses of the narco-paramilitary mafia. The latter, and their closest allies in government – the Centro Democratico party – have been trying to remove Gustavo Petro from politics for years. It is as well to recall that, during his time as Mayor of Bogota (2012-2015), they tried to destitute him at least 3 times, with unsuccessful and archaic accusations of “threats to privatization”, “chaos in waste disposal” (for giving jobs to recyclers) and the “crime of allocating transport subsidies to the poor”. An attempt to disqualify him from public office for a period of at least 15 years was, also unsuccessful, in 2017, after intervention from the Interamerican Commission of Human Rights. They have, though, managed to practically bankrupt him by reviving (previously legally shelved) fines for the above “crimes”. Chief Prosecutor Martinez acknowledged to be using the Fiscalia to hack and spy on, what he considers to be, targets, including Senator Petro. So, it is unsurprising that ever since Petro and the Colombia Humana / Decentes political movement and its allies, won 8 million votes, last 17 June 2018, compared to Duque’s 10 million, the establishment started to get a bit concerned. The death threats and illegal set-ups against the opposition, have therefore been stepped up once more. During his rather inappropriate and irate defence last Tuesday, Chief Prosecutor Martinez acknowledged to be using the Fiscalia to hack and spy on, what he considers to be, targets, including Senator Petro. The problem is that there appears to be little judicial control, as to who is targeted. To many Colombians, this harks back to the time during Alvaro Uribe’s government (2002-2010) when the Departamento Administrativo de Seguridad (DAS – Administrative Department of Security) was used to eavesdrop and spy on the opposition. Back then, this was not just unlawful phone hacking – the names and personal details of the people hacked were then passed on to paramilitary death squads and many innocent people were, not only targeted, but assassinated. Things got so bad that the DAS has now been disbanded. And now? How is this is being regulated by a Chief Prosecutor, whose role is under severe scrutiny? At the end of the historic debate last week, Paloma Valencia, a somewhat unhinged Centro Democrático senator, purported to show evidence of dodgy dealings by Gustavo Petro by playing a (conveniently silent 14-year-old) video, where he is seen to receive cash from an unknown source. This week, that has proved to be another fabricated set-up against Petro. It turns out the money handed over was US$6000 meant as campaign donations from sympathisers, which were duly declared to the National Electoral Commission (CNE). But the bought-media have taken this opportunity to tone down coverage of the Odebrecht scandal, despite its remaining improperly investigated, and involving sums totalling, at least, US$50 million, in irregular payments. Even so, whilst the enormity of the Odebrecht-Aval-Martinez labyrinth is ignored, Gustavo Petro now faces a Fiscalía (Public Prosecutors) investigation, with Nestor Humberto Martinez, as Chief Prosecutor. It looks to everyone like the country is being manipulated by an all-encompassing mafia who have captured not just significant public works, but, quite possibly, sectors of the institutions of justice, as well. But recent events do mean that corruption have fewer places to hide and Colombians are unsurprisingly thoroughly disgusted at the sight. It looks to everyone like the country is being manipulated by an all-encompassing mafia who have captured not just significant public works, but, quite possibly, sectors of the institutions of justice, as well . In response, the corrupt networks have now launched death threats on all cylinders. Those feeling exposed are clearly still hoping to silence their critics and, at the very least, do a Lula-like coup on Petro, before too long. However, in Colombia, resistance to decades of repression will not be silenced. A national general strike by thousands of students, trade unionists, indigenous and campesino peoples is still on-going. Additionally, activists on twitter have this week asked everyone to move their money and pensions from Sarmiento Angulo’s banking empire to other entities, including the public pension system, which will actually result in better final yields. All this despite ESMAD violence and legal threats to the activists from Duque’s vice-president, Marta Lucia Ramirez, “for generating financial panic”. Ramirez’ dilemma is that her threat is in direct opposition to her government’s much-lauded neo-liberal value of “freedom of choice”. In any case, social media have rubbished her warnings and thousands have closed their Aval group accounts. Sarmiento’s Aval group is dive-bombing in the stock exchange. Colombia now has an institutional crisis on a huge scale, as citizens wonder what faith can be had in a government that, not only bars the opposition from lawful debate, as happened twice this week, but which also allows its Chief Prosecutor to carry on in this astonishing and anomalous manner . For example, the Ruta del Sol II - a 500 km stretch of road linking Puerto Salgar and San Roque in the Northern Colombia region of Cesar and the Ocaña-Gamarra route.